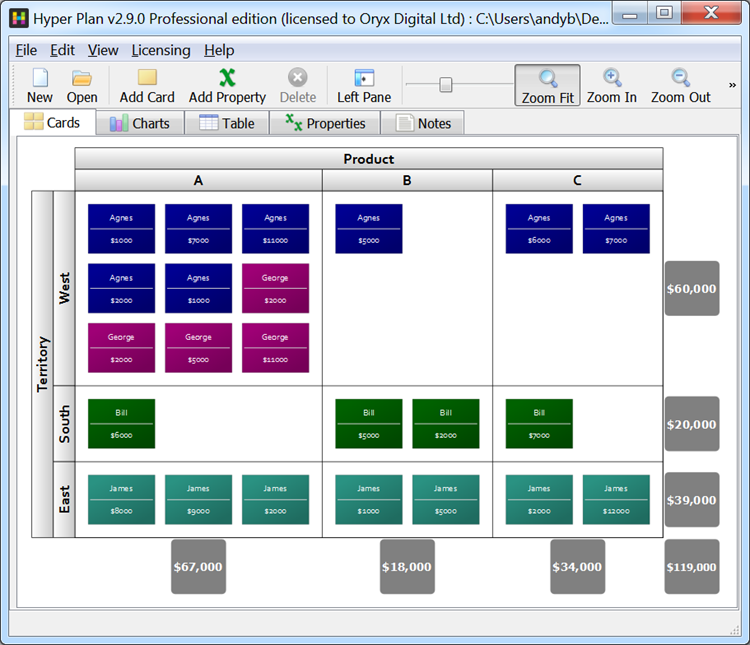 Hyper Plan is a very quick and easy way to make a pivot table on Windows and Mac. Much easier than Excel! Let's look at a simple example. We have a spreadsheet with some sales data. We want to quickly find out how much each salesperson has sold and of which product. 1. Download the example .csv spreadsheet file. 2. Start Hyper Plan. If you haven't already got Hyper Plan installed, you can download a free trial here. It should only take you a minute to download and install. 3. Select File>Open. Select the file type as CSV Files. Navigate to the .csv file and click Open. Select New to create a new plan file. 4. Type a name for the new plan file (e.g. "sales") and click Save. Arrange columns (X) by to Product. Arrange rows (Y) by to Salesperson. Show total for to Value. The sales values are now shown totalled by product and salesperson. It's that easy! 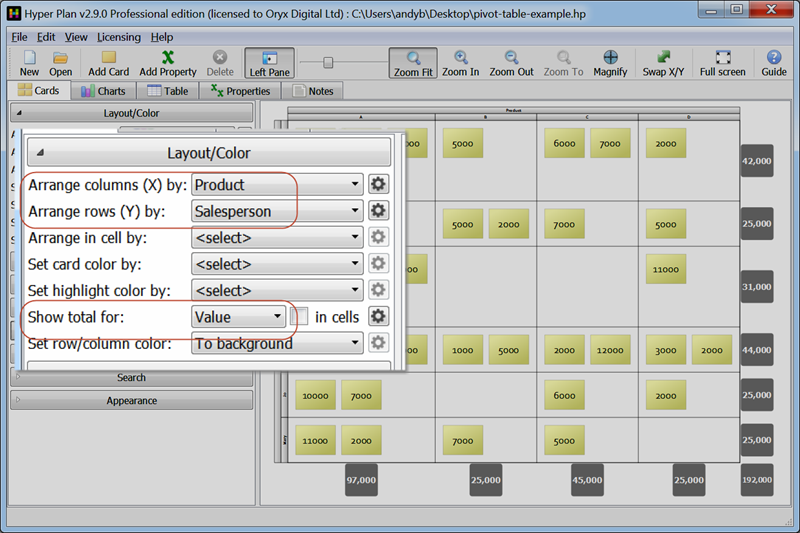 If you want to create a pivot table by product and territory you just need to change Arrange rows (Y) by to Territory. Set Show total for to Salesperson. Color the cards by changing Set card color by. Drag cards to different rows or columns. Notice that the totals update in real time. Use Show card properties to control what text appears on the cards. Use Filter Cards to hide some of the rows and/or columns. Use Stored Views to store different views of the data. Import your own data (if it is in Excel File>Save as in CSV (MS-DOS) format).